all the little stories» Blog Archive » chloe for penny. It’s a pattern called Chloe by Alana of Never Not Knitting. I’ve decided to skip the multicolored stripes, even though I think that they are super cute. I’m looking to make a sweet and basic cap-sleeved sweater that I can throw over one of Penny’s little summer dresses once the weather gets cooler and this pattern is perfect! And I chose a plain off-white, not just because I had it in my stash, but because I think it will go with everything. We can just grab it and go! How cute will she be? I’m excited! I’m sure I’m not a very fast knitter by some people’s standards, but I’m happy with my progress here. I had to rip this back yesterday morning when I realized that I had totally messed things up. Yup! I was faking it, like a true newbie, because I had no clue how to actually use place markers (I didn’t know that they should actually go on the needle, and not just hang out on the yarn! ), so I was veering way off course with each of my increases—yikes! There was nothing to do but take a deep breath and yank out the eight or so rows I had already knitted. But now I’m at about 14 rows. Feels good! The sweater is seen here on top of my yarn notebook (I wrote about making this a few years ago, here). It’s a covered composition book and I just love working with this thing! I keep all my yarn information in here and I’ll make notes in it, so that everything is in one place. If I need to count rows, here’s my scratch paper. If I need to remember the difference between M1R and M1L, I have notes to remind myself. It’s fabulous! So, I can’t figure it out: If I quilt one block of Katie’s quilt, I get an intense headache—even if I’ve only been at it for 20 minutes. But I can knit for a few hours and it doesn’t effect me. I don’t know that I’m holding either object any further from my face, but the eye strain from quilting is killing me! So… guess which project is getting more attention this week? 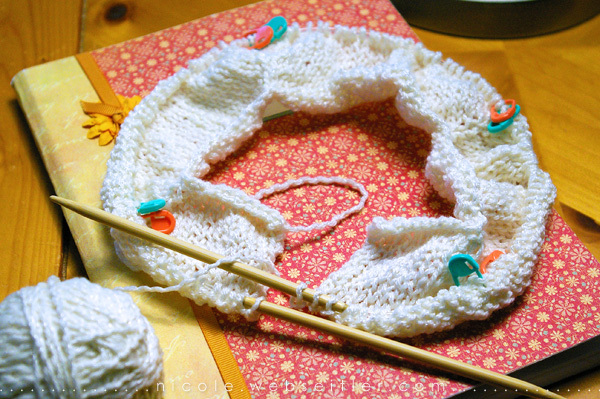 This entry was posted on Tuesday, July 20th, 2010 at 1:19 pm and is filed under arts & crafts, just life, knitting, penny. You can follow any responses to this entry through the RSS 2.0 feed. You can skip to the end and leave a response. Pinging is currently not allowed.